Had a meal here. Small portions.4 beers on, not very inspiring. Sharp's - Coaster (or Cornish Coaster) 3.60 Not enjoyable. Left some of it. £2,25 FOR beers on a tuesday. Had to go for it. Titanic - Plum Porter 4.90 Too warm. Freezing outside so why is this so warm? Very plummy. Adnams - Broadside 4.70 Better than I've had elsewhere. 5 beers on altogether. An afternoon visit and only a few other customers in. Ramsgate Brewery (Gadds') - Black Pearl Oyster Stout 6.20 Superb dark beer, absolutely delicious and exceptionally good value today at £2.25 per pint but £1.55 per half. Eagle (was Wells & Young's, was Charles Wells, was Wells) - Courage Best Bitter 4.00 Not Tried Camra discount offered on this beer. New landlord. Now offering 10% Camra discount. Boss is looking to get in more local ales. Small crowd in, 5 beers on. 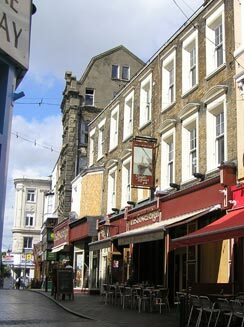 The pub is found in Ramsgate, Kent, CT11 8HA. Smith & Jones establishment called The Sovereign until early 2014 when taken over and renamed The Goose after a refurbishment. Very large open plan pub, converted from an indoor market in 2007. We have visited this pub 15 times, seen 23 different beers and tried 13 of them.